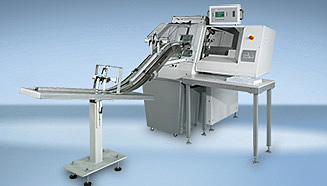 The POLAR DC system die-cutter is the center of a complete POLAR Label System. Integrated between the automatic cutting machine AC 25 and the BD single-head bander this die-cutter can make products which are freely definable in their design and not restricted to right angles. The system die cutter POLAR DC uses the puncture principle and is suitable for all common label papers. The POLAR DCC system die-cutter forms the main item of a complete POLAR Label System for die-cutting soft materials which can be compressed under load. The die-cutter uses counterpressure and is therefore particularly well-suited to special materials, such as plastic, metal foils and large label shapes. Stand-alone die-cutter POLAR DC-M works fully automatically according to the puncture principle. It is suited for any common label paper. Stand-alone die-cutter POLAR DCC-M is of identical construction, but works with counter pressure. Therefore it is perfect for special materials, such as plastics, metal foils and large-size labels. Both versions of POLAR die-cutters are perfectly suited for semiautomatic off-line production of labels. Small or medium-size products are especially cost-efficient to produce on POLAR stand-alone die-cutters. Easy setup, fast tool change and zero die-cutting make the POLAR DC-M and DCC-M solo die-cutters very profitable also in digital printing, wherever individual label designs are concerned.